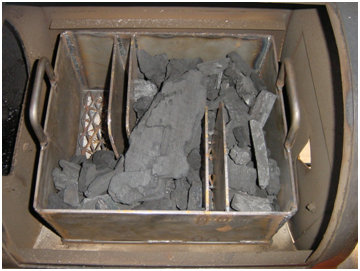 The Klose Charcoal basket is designed to fit inside the firebox of a Klose off-set smoker. 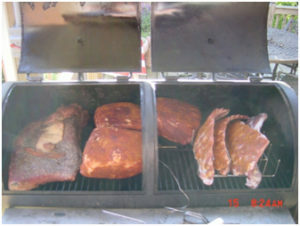 I have a Deluxe Smoker purchased in July. My only complaint has been problems getting a burn longer than 60-90 minutes. Now, don’t get me wrong, I love tending my stick-burner, but there are times when I just cannot dedicate that much time, & we still have to eat. I experimented with the Minion method by having 2 separate piles of lump charcoal in 2 different corners of the smoker. The problem is the radiant heat from the lit pile started burning the unlit pile almost immediately & still only gave me a 2 hour burn, but also went through double the volume of lump. 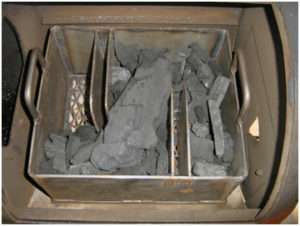 After some research I decided to buy a charcoal basket from Klose BBQ Pits. This thing is a monster weighing in at almost 60 pounds. As you can see, this thing barely fit into my firebox. I have a Longhorn offset smoker. These are made for Klose Pits. I filled the basket (about 3/4 full) with Cowboy Lump and left an empty spot for dumping lit charcoal into. As you can see in this pic above, the Cowboy lump size is totally inconsistent, and these were by far the largest pieces in a 20 lb. bag. I will avoid Cowboy when possible in the future. Briquettes are better. But NO Quick Lite or Matchlight charcoal. 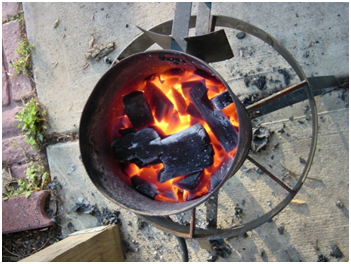 Briquettes fit closer together and less air can get through allowing a longer burn time. I dumped this into the space I left in the charcoal basket about 6:30AM. This picture is @ 7:34 one hour after dumping the lit lump into the basket. Temp at the grate level in the center of the smoker was about 270. Firebox damper was down to 1/4 inch open and smokestack was only 1/4 open. At this point, I completely closed the damper on the firebox to try and reduce the air and bring the temps down. @ 8:25, two hours after beginning the process. 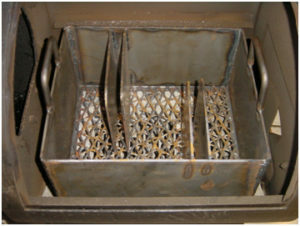 Notice the damper on the firebox is completely closed. Temp is holding steady between 220 and 230. @ 9:20, three hours after beginning the process. Temps still holding steady at 230 or so with damper on the firebox completely closed. @ 10:16, four hours into the burn. I added half a basket of lump due to concern about a temperature spike. Temp is still holding steady around 220-230 mark. At this point I added a half basket of unlit lump about every 2 hours. I am extremely pleased with this outcome. My hope is that with future burns, I can fill the basket completely with some decent lump or briquettes, close the air control from the very start and get a solid 5 hour burn. I also suspect that I can add more than half a basket on each reload and get a good 3+ hours from that point forward. I did end up using about 30 lbs. of lump for a 12-13 hour burn. I cooked three 8 lb. butts, one 13 lb. brisket and 4 small racks of Danish ribs. Here is my smoker loaded pretty solid with the test meat at 8:30 am when I loaded the ribs and the butts. Briskets had been on for 3 hours at this point. 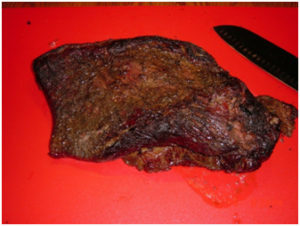 This is a picture of my Brisket 12 hours later. Look at that smoke ring. All in all, the charcoal basket was a success. If I can stretch to 5-6 hours and get 3+ hours each after that, then I am going to say yes. 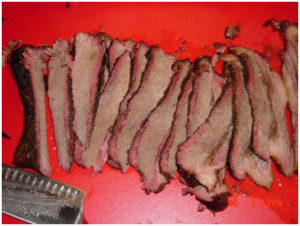 It is expensive compared to the cost of my smoker but to get some consistent temps for longer periods is worth some sleep at a competition, or time to run errands on the weekends. If your current offset is a temporary smoker until you can upgrade, it probably is not worth it unless the box is the same size. A permanent fixture? Then, this 60 lb monster will probably out last the smoker. If you plan on upgrading to a larger offset, I see no reason why this basket cannot be used on even some of the larger trailer style offsets. 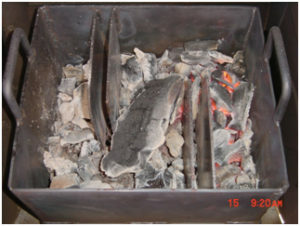 Look for upcoming updates about future stats on the charcoal basket. I‘ve used my charcoal basket a couple times already for long burns. I would say I get 6-8 hours of pretty steady temperature, usually in the 220-275 degree range, depending how I manage the damper. Dropping the lit coals on top of the charcoal, rather than into a hole at the very end (one user recommended using a 4-inch diameter log vertically, or a soda can does nicely at the end when filling the basket with charcoal. When ready to pour in the lit chimney, remove the 4-inch log/can and have a nice ready-made space to pour into). If you use lump, it will burn hotter and faster. 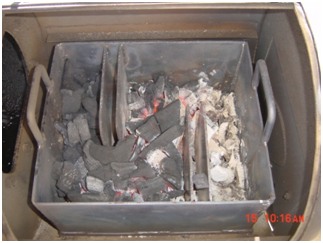 If you’re opening the firebox door at any time or opening the doors frequently can cause basket to burn faster. Remember if you’re lookin’, you ain’t cookin’. If the charcoal in the basket is not packed tightly enough. Doesn’t have to be perfect but the less air going through it makes it burn more efficiently. 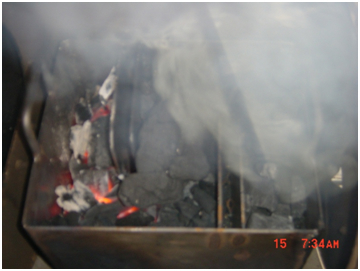 If charcoal spills over the metal dividers in between the air shields, they can ignite and cause the rest of the basket to start burning before it’s time. One user recommended after pouring in the lit chimney, to allow the smoker to reach 200 degrees and then to choke down the air inlets to 10-20%. And most importantly, using wood of any kind in the basket with the charcoal. 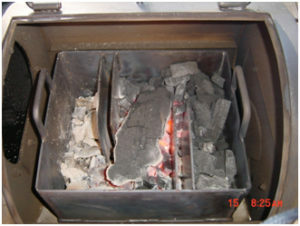 Dried wood will ignite at a temp of 572 degrees when a fire is present and at 1112 degrees with no fire. Therefore, igniting the part of the basket that is not supposed to be burning yet.